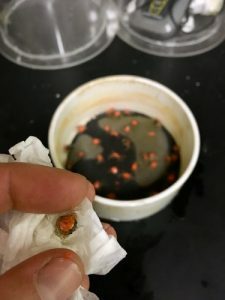 These past three weeks have been filled with getting to know my new coworkers, fieldwork, and our first run with the mesocosms mentioned in my first blog post. I began working with Ylva Durland and Kelly Muething, two of Dr. Brett Dumbauld’s technicians. Kelly just finished her masters degree at OSU and had Brett as an adviser so has worked on many projects with him. 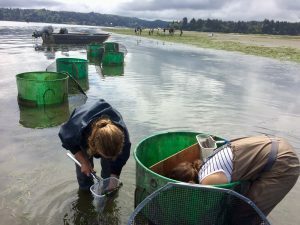 She is also continuing her work comparing the growth of two oyster types in and out of eelgrass beds. 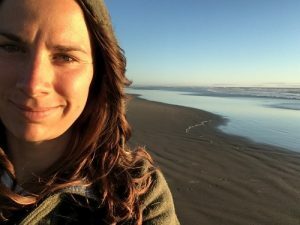 Ylva Durland had been working with ODFW’s SEA-COR program before beginning with Brett and is bringing knowledge on both eelgrass and shellfish. 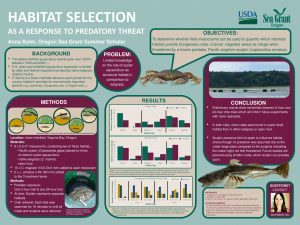 Ylva earned her masters in her home country, Sweden, studying predation patterns of green crab on native oysters. I feel lucky to be working with such talented women and Brett, and appreciate their support and guidance. We spent a hectic week finishing up preparations to have the mesocosms ready to deploy during the neap tides at the beginning of July. Being ready required collecting Pacific staghorn sculpin and housing them long enough to starve them for 24 hours, collecting over 130 second instar Dungeness crab and marking them with nail polish so we knew which crabs we placed at the end of the experiment, and acquiring oysters to place as our oyster habitat. We also had to find an appropriate edge of an eelgrass bed to work on. 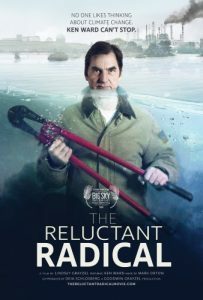 Most importantly, we had to determine how much time we would have during the tidal exchange to work within our two-foot tall mesocosms. 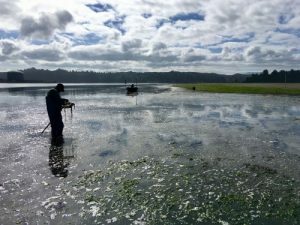 Dr. Brett Dumbauld USDA-ARS, searching for megalope in Yaquina Bay, OR. 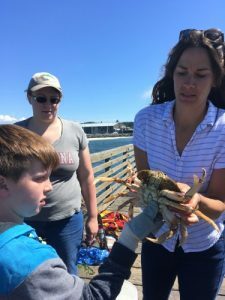 Tagging 130 juvenile Dungeness crabs with red and orange nail polish. On July 4th, we set out the mesocosms to acclimate to the environment for the following day’s experiment. 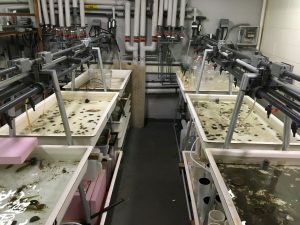 The next day, we placed the crabs in all mesocosms and gave them one hour to acclimate before introducing the predator into the three treatments. 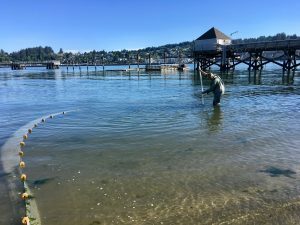 After another hour, we placed dividers along the edge of the habitat and scooped out the sculpin and as many crabs as we could. We recorded the number and color of crabs on each side of the mesocosms to compare against what was originally deployed. 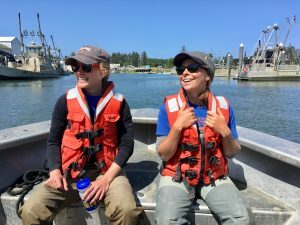 Ylva Durland showing off the installation of the mesocosms in Yaquina Bay, OR. An example of a mesocosm in action. 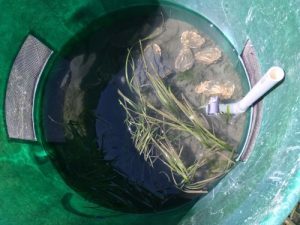 One side contains eelgrass, the other oysters placed to mimic on-ground aquaculture. There were two with this configuration to have a treatment (predator) and control. 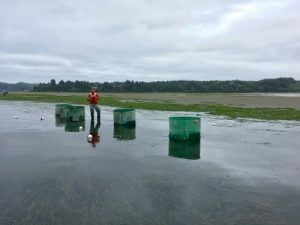 We also had a treatment and control for mesocosms with oyster aquaculture on one side and bare ground on the other, as well as eelgrass on one side and bare ground on the other. Ylva Durland placing the two sculpins into a treatment tank with Kelly Muething on standby. 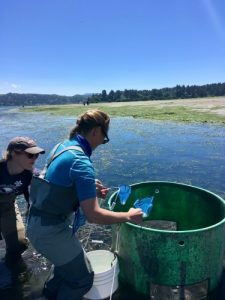 Our preliminary results show a trend of higher crab presence within eelgrass and less movement of crabs in the treatment mesocosms. However, we only retrieved 76% of the crabs deployed and are unsure if they were eaten or simply weren’t retrieved. We plan on rerunning the project in early August and are still fine-tuning the details beforehand. 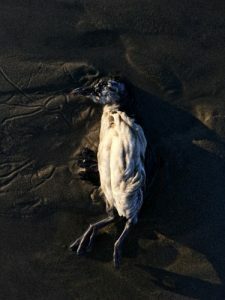 I’m happy to say that I’m writing this blog while sitting in my hotel room, looking out on the Pacific Ocean. 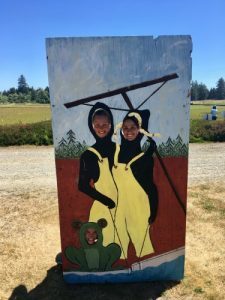 We are currently on a field-trip to Willapa Bay and staying in Long Beach, WA. 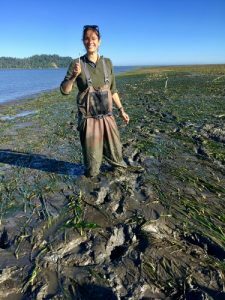 We’ve been out in the field collecting data on burrowing shrimp size and frequency, checking on Kelly’s oyster growth study, and sampling native eelgrass to measure biomass later. Between the boat rides, working outside with great people, and stopping at the Cranberry Museum, it’s hard to choose a favorite part of the trip! 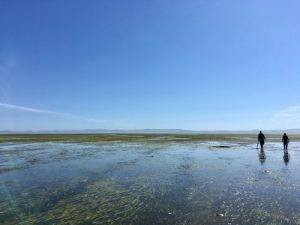 Brett Dumbauld and Kelly Muething heading back to the boat over the tide flats in Willapa Bay, WA. Me and the trusty toothbrush I used to remove periphyton from the oyster-growing tiles for Kelly’s project in Willapa Bay, WA. 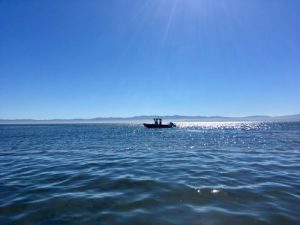 The boat waiting for us while we collect and monitor burrowing shrimp in an oyster aquaculture site in Willapa Bay, WA. 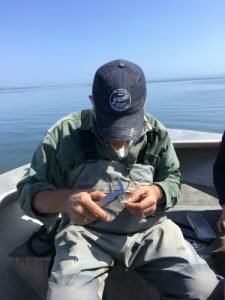 Brett Dumbauld measuring ghost shrimp carapaces collected from one of the monitoring sites in Willapa Bay, WA. 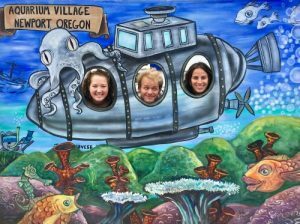 Kelly Muething (the frog), Ylva Durland (left), and I (right) taking advantage of the photo-op at the Cranberry Museum in Long Beach, WA.